Detroit USSF Trip a Success! After a jam-packed week in Detroit and a long van ride back, I'm finally beginning to catch my breath and process everything I saw and learned at the US Social Forum. The Atlanta group stayed busy, spreading out and attending events all over the city. We were at workshops--AFSC's youth organizing against military recruitment, video messages from the Zapatistas about "The Other Campaign," the legalization of marijuana, justice and water issues, justice and sports, transformation theory, socialism, anarchism, etc. Some of us also attended opening and closing ceremonies and the evening plenaries, with panel members from all over the US and even international speakers. 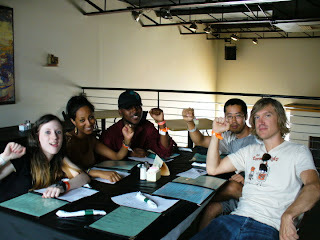 We were at concerts, parties, and spoken word events by the river and at venues around the city. We explored the city and learned about the tough issues Detroit is facing. Some of us even saw a HUGE art installation called the Heidelberg Project taking up a whole block of houses, many of which are run down and abandoned. Most of all, we were meeting people from all over the world doing important work, having discussions and debates, and getting a sense of the spirit of the people working for change in the US! Many of us on the Atlanta caravan did not know each other before this trip, but we hope to continue to work together in the future and to bring more Georgians on board with us. AFSC Works to get Youth to Detroit! 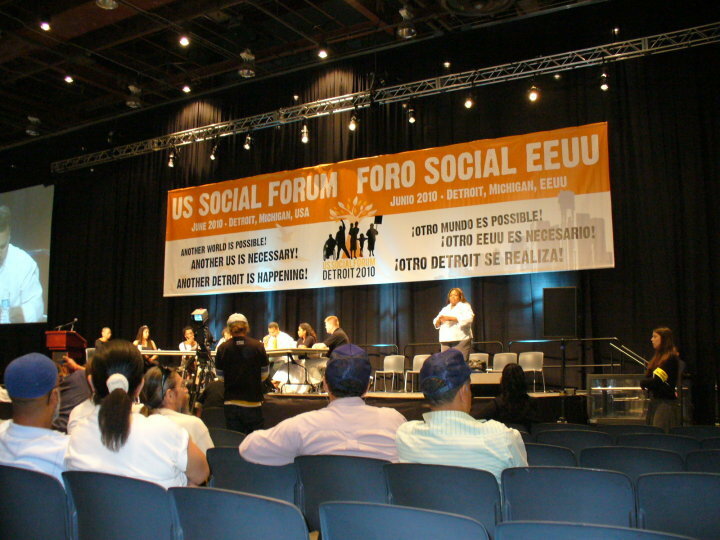 A few months before the 2nd US Social Forum, the AFSC decided we needed to add to the momentum of the 2nd US Social Forum by gathering more Georgians, especially youth, to attend the event in Detroit. 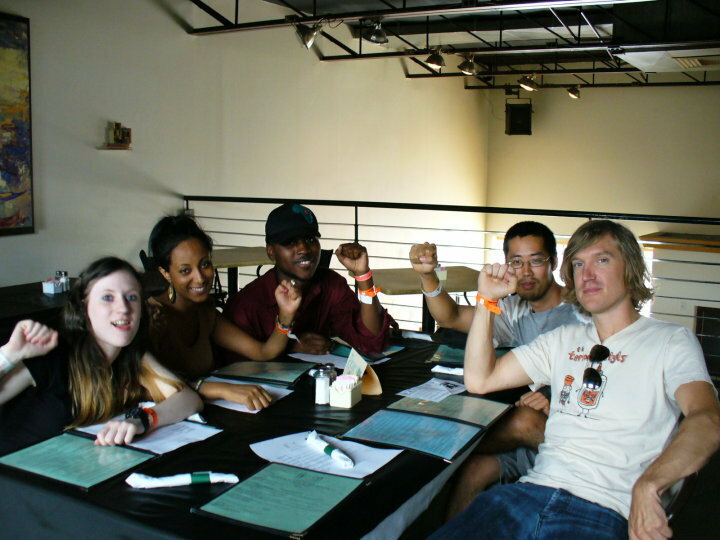 The first US Social Forum in 2007 was in Atlanta, so it only seemed fitting to continue the involvement of the local community. So we began to put the word out that there would be an AFSC caravan, announcing it through listserves and facebook and eventually promoting the event at group meetings and through Brian Sherman's radio show on WRFG, Atlanta's progressive radio. 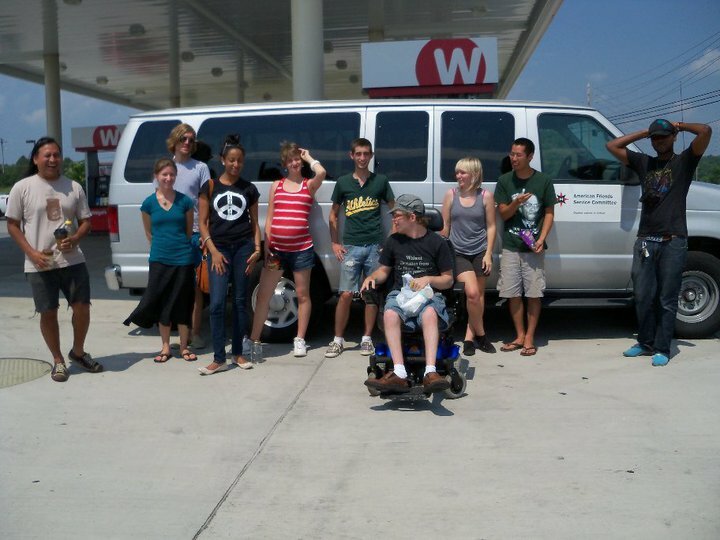 We worked with the Georgia State University Progressive Student Alliance organized a 7-passenger van leaving Atlanta on Monday and a 15-passenger van leaving on Wednesday. We struggled with resources and were only able to offer these limited number of seats but were glad to see interest mount as the event approached. Our final caravan included an eclectic mix of people from around Georgia, as well as a few from South Carolina and Alabama. 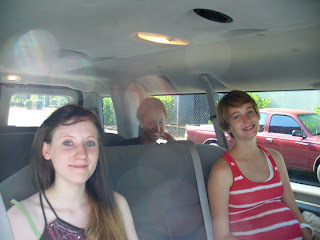 Thanks to a few generous donors, we did not have to turn away anyone who could not afford the trip. By carpooling in vans and staying in the USSF Solidarity Housing, we were able to make it an affordable trip....Vans and solidarity housing also allow LOTS of opportunities for bonding and networking! After a long drive to Detroit, we finally arrived at the "Olympics of Social Justice Work," the US Social Forum. As soon as we stepped into the crowd of like-minded activists from all over the country (and world! ), it became clear that all the organizing was worth it. We hope the week's events and workshops will allow these 20 or so folks from the Atlanta caravan to return with a wealth of knowledge and inspiration to share back home...Check back for highlights from USSF events!! Months ago members of the AFSC national youth and militarism task force had brainstormed on the possibilities of doing a collaborative workshop at the United States Social Forum. What seemed especially exciting was the possibility of bringing together youth from different parts of the country to talk about their experiences with challenging military recruitment in their schools and communities. Our biggest challenge was of course finding the money and staff time to do it. Solid organizing commitments came out of Atlanta, Chicago, and New Hampshire. Though there was a conference call and some coordination between youth in each city leading up the the USSF, we really didn't plan all the details of the workshop till we all could get together in Detroit over a much deserved dinner. It was in the park, outside the restaurant, that folks from Atlanta, Chicago, and New Hampshire sat in a circle and discussed the flow of the workshop and decided who among us would do what. The workshop we all planned included group activities, sharing sessions, a youth panel of experienced counter military recruiters, Q&A, and the world premier of AFSC, "Before You Enlist" 2010 edition. A lot to pack into two hours, but thanks to skillful facilitation by "Flowmaster" Molly Messenger and Timekeeping by Erica Schoon we did it. The workshop drew in folks from all over the country, including high schoolers, college students, and one parent. There were even a few folks that were interested in building a counter military recruitment movement in Guam. For me personally it was great to hear what was working in other communities. Counter military recruitment work can be much quieter than typical anti-war activism, and it often requires more patience, diplomacy, and discipline. It's also very rewarding, and the results are tangible. They last a lifetime for those we are able to reach. It was great to be in the presence of so many amazing young facilitators who continue to work to de-militarize their peers. One of my highlights of the day was right after we closed the workshop. I met two brothers from rural Illinois who were interesting in doing counter recruitment work. One of them had recently written an extremely articulate article for his fairly conservative high school paper on the issue of military recruitment. They both expressed feeling pretty isolated from other folks that got the real lowdown on military recruitment. We'll see how it works out, but I'm pretty sure the AFSC's Chicago office will be tabling at their next career day. We might even be able to organize a viewing of "Before You Enlist" on their campus as well! USSF Spot Light on the Gandhi Brigade!! While I was working the AFSC table I couldn’t help but notice a really energetic group of young folks with these amazing DIY Gandhi shirts. When they came buy the table I asked what the shirts were all about. They we all youth organizers with the Gandhi Brigade, a youth media group outside of Washington DC. They invited me to their workshop on youth media production but I declined as it was a few miles away and I had a lot going on already, after some pressuring and the offer of a ride to the workshop in their Gandhi van I changed my mind and decided to give it a shot. I’ve been to countless youth led workshops and activities; this was one of the best. It was clear that this group of young people had worked together for some time, had a passion for justice, had a head full of knowledge, and knew how to facilitate a workshop. The Gandhi brigade’s analysis was that many youth media Organizations go out and shoot footage without putting much energy into the most important aspects of pre-production, namely story development. The workshop had a strong focus on story development. We were split up into groups of six and shown how to develop of own genome sociogram. We were to explore each other’s family histories in an effort to the links in our collective history. Our story was to have some foundation in common struggles. This was a process that clearly needed more time than the actual workshop allowed but it really sparked my brain. I believe the exercise is an excellent way for folks from very different backgrounds and belief systems to find common ground. Our next task was to develop a theme, a pitch, and a treatment for our story, which could be a video, a PSA, an article, a film of some sort. After groups had time to develop their stories we each got a chance to share what we came up with. Before closing the Gandhi Brigade folks shared a little bit about the process of story boarding and handed out media tools packets to everyone. It was the best kind of workshop, fun, great energy, and we all left with a tangible skill we could all bring back to our communities! Thanks Gandhi Brigade! From Atlanta to Berlin, Resist Don't Enlist!! I knew that the topic of street art and graffiti would come up in Berlin for two reasons. One, it really does have some of the best street art in the world. Two, Shauna and Bjoern Vogel where hosting me. Shauna's a childhood friend, Bjoern is the extremely talented artist that Shauna married. Bjoern and I had gotten to know each other while he was living in Atlanta and had many online conversations with him about current events. Bjoern and I pretty much started talking collaborative possibilities immediately, as I am a budding street artist myself. We talked about the possibility of doing some sort of global "Cost of War" campaign that would provide an education on the human and economic(one in the same) cost of war in different countries through art. The possibilities really caught my mind on fire as we both know people in dozens of major cites. We did decide to look at some short term collaborative possibilities and came up with several concepts for murals to paint in Berlin. We talked about exploring several themes, we wanted to explore the similarities of German soldiers and the Afghan fighters that they are trained to kill, the economic injustices in the German Enlistment process, and how much money is taken from German communities and spent on war(billions). We jointly designed a pretty awesome mural that will go up in the next few months and today Bjoern painted, in a legal space, a pretty great mural that's based on the classic German anti-war book, "Die Abenteuer des Werner Holt". Bjoern decided to include what has become one of the slogans we often use in the Atlanta Truth in Military Recruitment movement, "Resist Don't Enlist" as a homage to our work in Atlanta and a message to the Berlin community. In Germany young men have three choices after they turn 18, military service, social service, or college. Many lower income young men choose military service because they are told that it will help them develop a career in the military or learn job skills training, these promises often don't become realized. Germany is in an economic crisis. Over 15% or Berlin is unemployed yet billions continue to fall out of the sky for war funding. Recently the German President, Horst Kohler, was forced to resign after making several bold statements against Germany's involvement in Iraq and Afghanistan. This makes it clear that while there are many who pay for German's involvement in America's war(including the over 300 dead soldiers and countless injured), there are a select few that do profit from it. With President Obama's recent request for Germany to commit an additional 1000 troops to the Afghanistan, it seems like a good time to be creating art in Berlin that spark conversation about the issue. I look forward to further collaborations with Bjoern and many of the other amazing artist from my new favorite city, Berlin! I've been looking forward to a vacation for a while, especially this one. Four years ago a very close friend of mine moved to Europe and this vacation was an opportunity to visit. It just so happens that he's been staying in Prague, Czech Rebulic for over a year now. I've heard nothing but great things about the city and I frankly need a break from Atlanta to regain my breath. 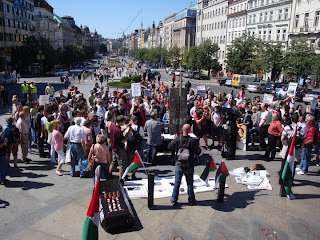 Within the first day of arriving in this beautiful city I became aware of Gaza attack on the Flotilla. I was honestly quite shocked, equally shocked to hear US and some international press promoting Israel's excuses for boarding these boats on international water in the middle of the night and killing unarmed peace activists. The wildest accusation was that folks on the Flotilla had links to terrorist, simple lie created out of thin air, I personally know some of these folks and am very familiar with the organizations involved. I appears the only terrorism aboard that ship was at the hands of the heavily armed Israeli military personel, which we know killed at least nine people with 30 bullets, harmed an additional 82 people, 30 of whom were shot with bullets. 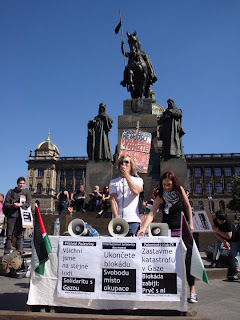 One of the first things I did when I got to a computer was google Flotilla attack+Prague demonstration. I immediately found Eva Adams, a local organizer with International Solidarity Movement. 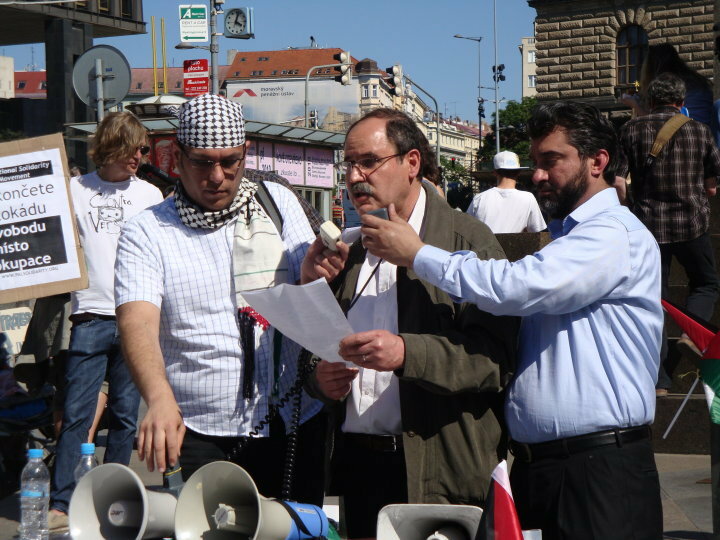 Her group had been working with another local group, Friends of Palestine, to organize a series of demonstrations against Israel's attack of the Flotilla. 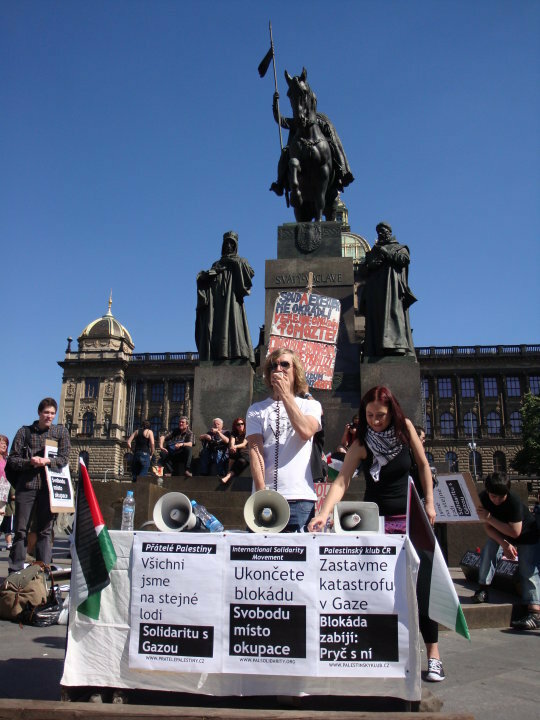 On my second day in Prague, a city I really knew little about, I found myself in front of the Israeli embassy holding a sign that said, "End the Blockade, Freedom not Occupation." We marched to the Turkish embassy and organizers spoke with a representative and left flowers in remembrance of their fallen. 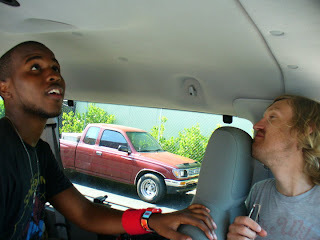 I met several very nice folks who helped me find my way around the city, none more helpful then a young man named Ondra. Ondra made sure I had directions to each demonstration and offered to meet me at the metro stations to insure I wouldn't get lost. 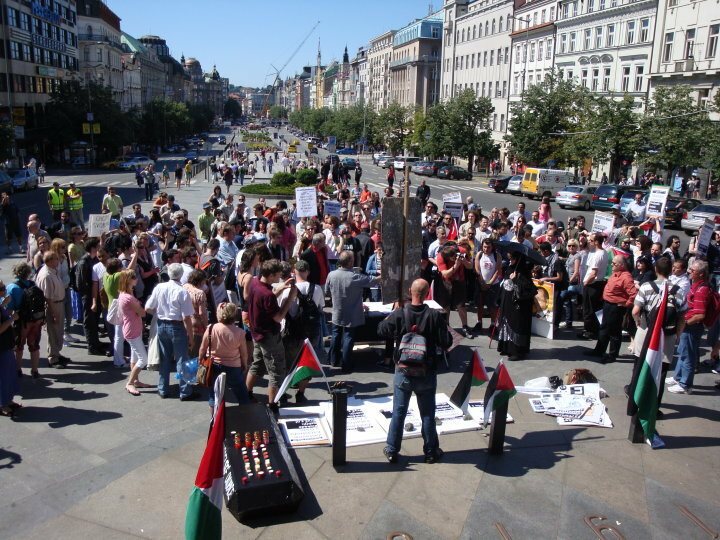 After online correspondence with Eva she asked if I would be willing to speak at their upcoming demonstration in Wenceslas Square, which is the place Prague goes when there's social unrest. I was surprised as it was clear that I do not speak Czech. Eva thought it would be good to have one english speaker, as many in the country speak english, and it might be good to hear from someone who personally knew someone on the Flotilla. 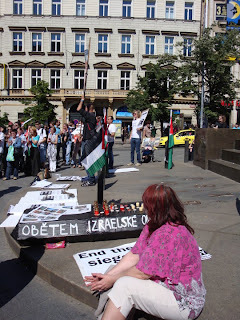 There were actually several people at the demonstration who knew folks on the Flotilla, including Eva. 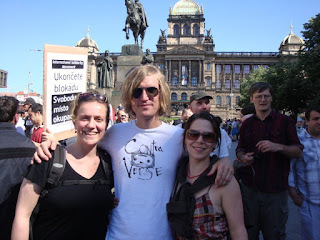 In fact there was one man from the Czech Republic that was actually on the Flotilla, and he was able to join us. After several people spoke I took the stage and spoke briefly of what I had heard from the Flotilla, and what my Gaza co-workers had reported from the ground on the local reaction to the international response to the attack. I spoke about the Movement to End Israeli Georgia and the need to build and link a global movement to cut cultural and economic ties with Apartheid Israel. 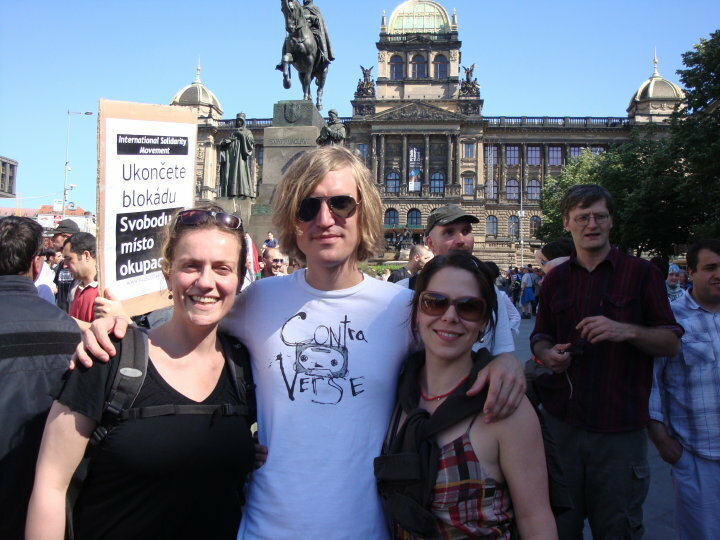 We then marched to the embassy again through the busy streets of Prague, very exciting. My experience here in Prague had affirmed the idea that we need not wait for our world leaders to lead us to peace and justice, perhaps they never will. At this point the stakes are to high to wait around for them to save the world. We are going to have to be the agents of change if things are to change. We must build a movement beyond borders, bigger then governments, bolder then they could expect. We must unite struggles against racism, militarism, and economic injustice. No where do these evil's converge on one spot as they do in Palestine right now, and as an American, I'm aware of the intimate connection I have with the gears of this conflict.